TerraAtlas is a useful tool when company's staff is away from their computers and still need to access GIS products in the field (click here to learn more on TerraAtlas). Among applications where a printed TerraAtlas is handy are projects of government departments of transportation, emergency preparedness, police and fire crews; construction projects; delivery routes and logistics. Customized TerraAtlases can be produced in bulk. 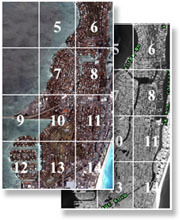 Please request more information on TerraAtlas volume printing and data overlay customization at .